Excelon flooring tiles are available in 18-by-18-inch and 12-by-24-inch tiles as well as standard size 12-by-12-inch tiles. 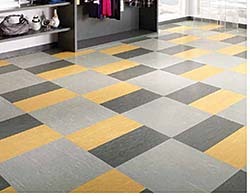 Flooring material is made of 85 percent North American limestone, is low VOC certified by FloorScore, and is part of Armstrong's VCT Recycling Program. Available in 37 colors in all three sizes.